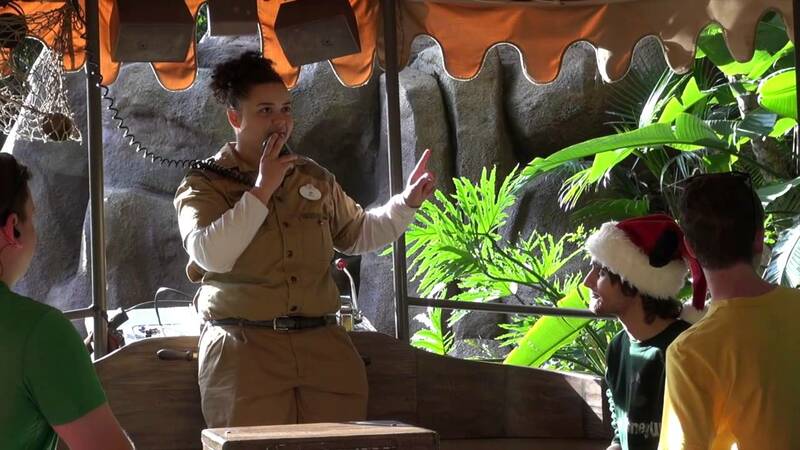 The holiday edition of the Jungle Cruise sets sail at the Magic Kingdom again this year. Damage to the landscape is going to take more time to be show ready. I love this ride. Went on it twice last visit! Not a big fan of riding in a boat looking at fake animals. They look fake and the ride is a little boring. Skip this and ride the safari at animal kingdom. Now that's a ride! Loved this one growing up. Classic ride, of course. Still try to catch a ride when I visit WDW, but the line can be pretty lengthy. The Jungle Cruise takes guests through a river cruise along the tropical rivers of the world. A friendly skipper delivers a live narration at rapid fire pace, and it's non-stop humour the whole way. The Jungle Cruise was based on Walt Disney's True Life Adventure seeries. The original idea for the Jungle cruise at Disneyland was for it be much more serious, and to include real living animals. Once this turned out to be impractical, the show was designed to use Animated Figures instead. The original version in Disneyland originally opened without the much loved humor that we enjoy today. The light hearted version was introduced in the early 1960s, a few years after opening. When it came for the Jungle Cruise to be built at Walt Disney World, the same jungle humor as created by legen Marc Davis was once again the basis of the attraction.